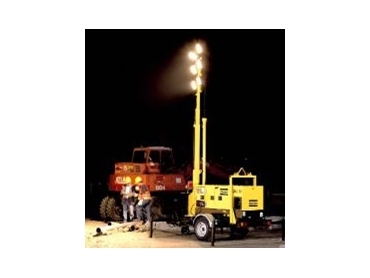 ATLAS Copco has developed the QAS 14/18 “Daymaker” portable lighting tower which enables the generator to be removed from the lighting tower trailer and used separately. In smaller hire companies the cost of purchasing dedicated generators and lighting towers is often not feasible. Having two products in one not only reduces capital expenditure costs but also increases the plant utilisation. The “Daymaker” further offers additional electrical power - around 6 to 12kVA depending on the generator model and number of lights - to run electric tools at the same time as powering the lights. QAS generators have a sound pressure level of 63dBA at 7m, reducing the noise typically emitted by dedicated lighting towers. The new generation lighting tower is available with either the QAS14 (14kVA) or QAS18 (18kVA) generator, both with a rated speed of 1500rpm, rated voltage of 415V and rated current of 19 or 24A. The generator can run autonomously on a single 85 litre tank of fuel for either 26 or 21 hours depending on the model selected. The unit has a hydraulically powered mast for lifting, lowering, standing up and laying down the unit as well as separate mast locking devices and 360º of mast rotation for easy repositioning of light. The tower supports four, or an optional six, 1500W Sylvania metal halide lights each with its own circuit breaker and RCD protection. The generator is powered by a 12.8 or 16.4kW liquid-cooled Yanmar engine and sits on a heavy duty single axle trailer with leaf-spring suspension, fixed or optional retractable towbar with jockey wheel, and a 50mm ball or ring coupling. As well as these standard features, a range of options are available such as a Landcruiser undercarriage for improved off-road capabilities and 8000W lighting. The new tower is suitable for a range of outdoor applications where lighting is required such as drilling applications, construction sites, road works and sporting events.